The longest distance for one day to date for me – a cool 121km. It was hard earned too; almost eight hours on the board! As a result, there were alarmingly few photos taken today. The first five hours were skated in a groggy, tired daze, despite the good sleep last night, and the last three hours were skated through air that could be likened to the atmospheric equivalent of treacle. My mum emailed me recently and informed me that according to New Zealand media reports, Olympic athletes are experiencing issues with the smog in Beijing. I am 2,000km away from Beijing, and it is still the worst pollution I have seen so far in China. Beijing must be horrid at the moment. It was mostly downhill and smooth roads today, with a slight headwind. I pushed on and on, and found myself on the outskirts of Lanzhou before I had a chance to stop for the night. The original plan was to split the Minhe to Lanzhou leg into two days. Marija Kozin had warned me that this stretch from Xining to Lanzhou would be a mess of industry. It wasn’t as bad as I had envisioned, but the pollution was terrible. Over the last few days I have developed a persistent cough, so I will be getting something to wear over my mouth for the onward 2,000km to Shanghai. 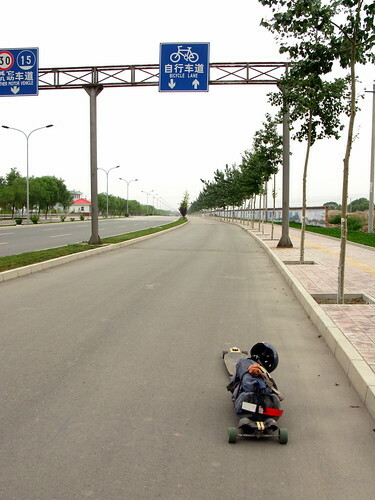 The trailer, despite the large crack in the base, survived all the way to central Lanzhou, in part helped by massive smooth cycle lanes leading into the city. My feet at the end of the day bore testiment to the dark dusty route today. Ouch! No fun for your feet. Congrats on breaking your previous one-day distance record though. Just been down to visit Mum and Dad, who saw your thing on Campbell Live and were impressed. I move to Kenya on Wednesday (13 Aug) so might have a bit of catching up to do between leaving and whenever I next get to good interweb. Will keep you in my prayers though! Mate, 121k's in 1 day on that – that's pretty good going! The photo of your feet reminds me a bit of my biking days round the Middle East – only worse. Wow! That was good skating! Perhaps you'll have to get some surgical masks, like the traffic police wear in Tokyo, to filter out the pollution. I thought it was pretty bad in Bangladesh but it's obviously worse there.